About: The primary focus of the SMART group is to develop “functional” materials and integrate them into a Microsystem or Micro-Electromechanical System. The group has a particular interest in thin film piezoelectric materials, but we also develop other materials. Some applications that we have explored are included in the figure above. 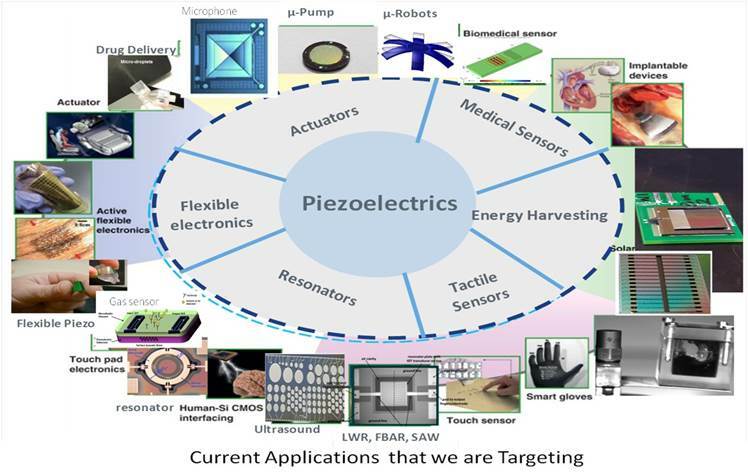 The group specializes in vibrational energy harvesters, atomizers, acoustic resonators, and flexible/stretchable MEMS devices, with an emphasis in biomedical applications. The group is also involved in developing novel microfabrication methods and MEMS packaging.